2290. A retreat with incredible women of God. 2292. Going from laughter to tear filled prayers. 2293. The beauty of fall. 2294. Getting to facetime with my daughter. There are so many things we can be thankful for. Big things, and small things. Our kids need to learn how they can thank God and for what they can thank Him for. There is an adorable new book to help your child with just that. 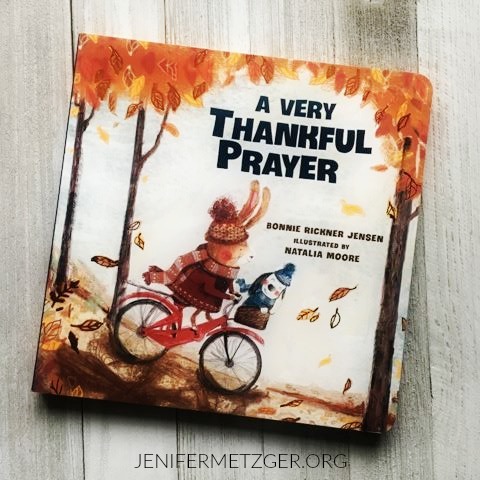 A Very Thankful Prayer will show your little one that they can be thankful for everything as they read through all the different ways the animals are thankful. The fun pictures and bright fall colors will grab their attention as you read to them. Pick up A Very Thankful Prayer HERE and let a tradition of thanksgiving begin in your child's heart. To enter to win a copy of A Very Thankful Prayer, complete each task in the rafflecopter below. My daughter says she's thankful for her family.